My trip through France, on two trains with an overnight in Paris, went smoothly. My last night in France was in Cherbourg, on the Normandy coast, and since I was there on June 6 there were many signs about D-Day reenactments. The old center is a bit touristy, but the old buildings and small, winding streets were lovely. I strolled a bit, got a much-needed hair trim and spent a lot of time in my room catching up on my writing. I took a wonderful long walk to the ferry port, where I began a 20-1/2-hour ride to Ireland. Late in the night there was a ferocious storm with thunder, lightning, and huge crashing waves shaking us all thoroughly, and I felt quite ill. The nausea stayed with me all the next day through three bus trips to my destination, Kinsale, with headache and queasy stomach. My four Transition hosts, gathered for a potluck meal, were kind and helpful, and I thoroughly enjoyed my evening with them. But by the time I got to where I would sleep, I was in rough shape and really needed a good night’s sleep on a non-moving bed. 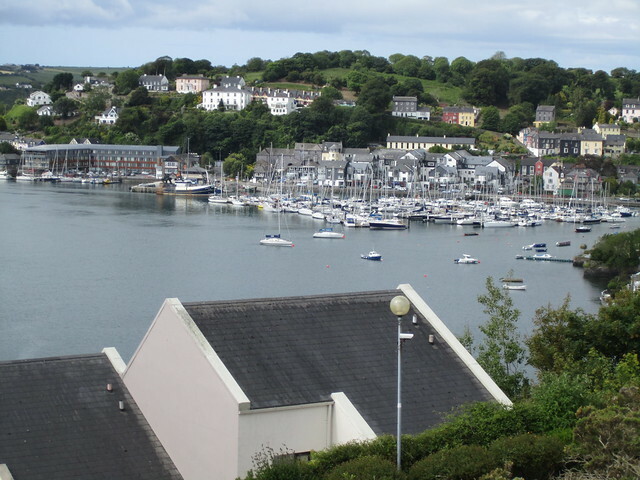 Kinsale, where the Transition movement first took root, is a lovely, little, medieval sea-coast town that sits at the mouth of the River Bandon in County Cork. Its population is about 2,500, but that swells with all the summer visitors. They consider themselves a “fair trade community,” according to their website. Multose Church, in the town center, is the oldest church in Ireland that is still in use; parts of the buildings were constructed in the 12th century. I noticed that the road signs in Ireland were all in two languages. I learned from Liz, my overnight host, that Ireland’s other language is Gaeilge, which is to some called Irish Gaelic and in the traditional language Ireland is spelled Eire (which means land of hope). All road signs and other notations are in both Gaeilge and English. According to Liz, it’s mandatory for all school children to learn Gaeilge unless the child moved to Ireland after the age of 7. The word Gaelic connotes the old language of Scotland, Wales, and Ireland, and so using the term for a particular country is incorrect without identifying the country. 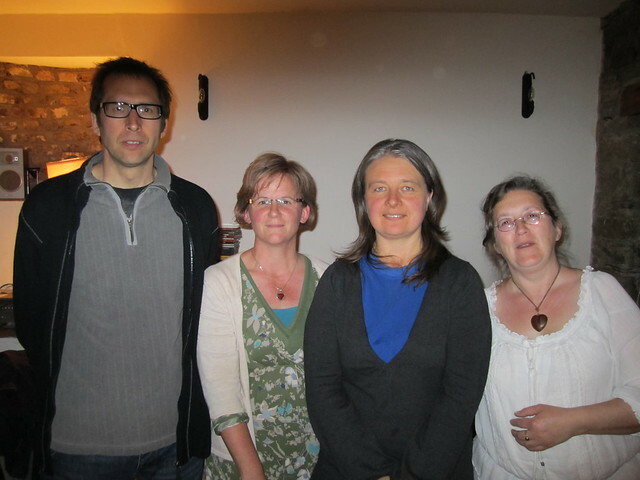 The Transition Kinsale, organizers I met with were Liz Creed, Klaus Harvey, Hilda Ryan-Purcell, and Jeannie Timony. In the early 2000s, Rob Hopkins, author of The Transition Handbook, was a professor at Kinsale College of Further Education while living in an intentional community nearby. He was a permaculture designer, and in 2005, along with students and locals, he wrote an energy-descent plan for Kinsale. In the same year the college hosted a “Fueling the Future Conference,” with such notable speakers as Richard Heinberg (author, educator, speaker on peak oil), David Holmgren (co-originator of the permaculture concept), and Eamoun Ryan (who later was Ireland’s Minister for Energy for four years and represented the Green Party). This conference was an incredible success, and in early 2006 the town council gave 5,000 euros as support for Kinsale becoming a Transition Town. Boy, don’t we all wish we could get that kind of support from our local political administrations? The Transition Kinsale steering committee, with 12 members, meets every three weeks. Their e-mail list has 250 names. There are 9 to 10 subcommittees, which were originally organized out of a 2009 open-space event. My contacts said that about 30 percent of the town really knows and understands about Transition and 60 to 70 percent have at least heard about it. Currently they are working with the town, with help from a European grant, on a feasibility study for an anaerobic digester to create bio-gas. There will be a public consultation in late June, which will be the first effort at public awareness-raising. Each fall they hold an Autumn Food Fest & Harvest Celebration. This includes food to eat, a cafe, and a “5-mile competition.” At the end of the day they hold a concert. In the spring they sponsor a Spring Fair, which is a major fundraiser with workshops. Also, they hold annually a Sow & Grow seed swap with workshops. Two members set up a CSA using the Transition network and now it is operating independently. There’s a second CSA, supported by Transition Kinsale for oats, quinoa, and potatoes, which provides “veg bags” for members (weekly bags of food). The grains are an experiment to help create a stronger local food supply. Liz Creed, who was my host for the night, has been a member since 2006. She’s working on improving mobility with coastal walkways and bicycle ways. She also organized a 50-mile meal award given to the most exquisite meal created from local products, which helps bring menu awareness to the citizens. Liz is drawn to the Transition movement because of its positive way of looking at a future that is going to be different, and because the movement is going to bring about that change in each of us first, instead of a top-down approach. She also appreciates how the process engages all people and that it is very inviting. Liz had been reading books about the problem and was wondering what she might do to make a difference. Wshen she read about Transition, she wanted to be involved. Liz’s vision includes people sharing responsibility and getting out of their homes, their shells, to come to know each other, and to feel secure and happy. She wants people to be able to stay in Kinsale if they want to, which means having a healthy economy. She’d like to see people using the resources that are available in Kinsale and people living more at one with the planet they live on, sharing the resources of water, soil, etc., and taking responsibility for their waste. Liz hopes there’s a global vision emerging. She feels Kinsale will be fine due to their small population and agricultural lands, but that’s not enough since she feels a sense of responsibility beyond Kinsale. She sees trade changing to be more equitable and reasonable. She hopes that people of the world recognize that we are all the same and we are living on this small planet together. Liz believes there needs to be a global environmental policy that comes from our elected representatives, as well as the bottom -up work of Transition initiatives. Hilda Ryan-Purcell joined Transition Kinsale in 2007 because a friend brought her to the Spring Fair. She’s a massage therapist and has a holistic healthcare website. She wants to organize a heath consortium to be supported by Transition Kinsale. When Hilda was newly arrived in Kinsale, she wanted to integrate with the community, and she was drawn to join Transition Kinsale because she met so many interesting people doing the work needed to be done. Her vision for Kinsale is simple, that the town should continue what it is doing since so many good efforts are already underway. She tends to think at the ground level and if she thinks about the global situation it gets to be rather scary. Jeannie has also been a member since 2007. She works with Education for Sustainability, which is a program in the schools and she teaches about Transition and leads guided visualizations. It’s all volunteer, but they are hoping Transition Kinsale will receive some funding for their efforts. Jeannie is helping to organize a Joanna Macy-inspired workshop later this year. During her childhood, community was very important, and she has felt the loss of community in the ensuing years. Transition offers her community and that’s why she’s part of the work. She has also appreciated the changes in agriculture that Transition is bringing about. She’s inspired by the community resilience of the Transition movement. She can see lots of grassroots communities starting around the world. Klaus would like to see much more food growing in Kinsale. There’s already a food culture with CSAs, a “veg bag” scheme, and allotments, and there’s good soil, good air, good water in abundance. Klaus would like to see the community grow in creativity, recognizing that that growth has already begun. A community that sings together, creates together, stays together. He wants people to create their own entertainment. Klaus believes there are lots of global visions emerging, recognizing Joanna Macy’s work on “The Great Turning,” the Arab world’s struggle for democracy, and so many more movements, and that it’s all about the same thing. Everyone is recognizing that the old system doesn’t work. If we don’t change we won’t survive as a species. Klaus thinks this is an exciting time to be alive. Although he feels the terror of what will happen if we don’t act, it’s what drives him on, it’s what makes him act. The next day I took a bus back to Waterford (though didn’t do any shopping for crystal) to my next host family. The couple I’d be staying with were away at a wedding, so their daughter-in-law picked me up and she and her husband fed me dinner and then took me to my meeting point with Transition Tramore. I mention all this because I found it so wonderful that an extended family is living together on the same land in three homes. The grandchildren of my hosts run freely, through wandering paths, among the homes, often stopping in at grandma and grandpa’s. This is not unlike what it was at the turn of the 20th century and before, and I hope the Transition will bring us back to strong families and communities. “Why don’t we meet at a pub for a pint?” That was the e-mail I received from Paul Flynn of Transition Tramore. And I responded, “yes, how Irish,” and that’s just what we did. Paul’s education is in environmental studies, and he is now a “Litter Warden,” or environmental officer, for the Waterford City Council. He works on issues of illegal dumping, etc. involving businesses and individuals. He’s lived in Tramore for 8 years. Transition Tramore began in 2008 and now has 16 core members who range in age from 21 to 60. They’re still working on recognition in the town. They held an energy show in 2009, which drew more than 4,000 people. They’ve had the traditional films and speaker events. I think his emphasis on community comes from his own experience when he was about 8 years old, when his father was on strike for two years from the paper mill where he worked. So they had no money. He remembers his mom cooking on the small wood fire heater because their utilities were cut off. The support of their neighbors, a cup of sugar showing up, or some cooked food brought by, is an incredibly powerful memory for Paul. Although they were financially destitute, they didn’t feel alone. He hopes that same level of neighborliness will grow out of the Transition movement. Paul thinks that people don’t really feel how big the problem is. He says that definitely there is a global vision growing. Just the fact of how the Transition movement has grown shows that there is change happening. He appreciated my work to help build the web, because it’s so easy to feel so separated from others in the movement. Transition Tramore promoted a 350.org event, planting 10 trees, which brought in many new people. He thinks this proves that there are great movements happening and there are great opportunities to unite in the work. The future looks bright because more people in Tramore are getting out of their homes and engaging with others in the town--Paul’s vision of a caring neighborhood. As an added treat,Paul and I had been invited to participate in a radio talk show, hosted by Garrett Wyse, who co-founded the community radio station in Tramore, TCR FM (www.tcrfm.ie). It was really a fun interview. The three of us talked about Transition work in a casual format and I’m looking forward to sharing the podcast with others, when it’s ready (probably not in time for this post). I get a sense that this movement is working because people are invited into fun gatherings. It’s kind of like Tom Sawyer painting the fence and pretending it was so much fun that his friends argued for a chance to do the work. Soon Tom was sitting back and watching them do the work. When we show how wonderful a strong, healthy, and resilient community is, people want to be part of it, and we’ll be just a part of it, instead of working so hard to promote it. So, let’s make sure to be playful and creative in our Transition work. The next day, after the train ride to Dublin, I had several hours to walk around before taking the ferry to England. Dublin is another big city, but the river running through it and some of the old architecture and pubs give it charm. The tram and bus service seemed very efficient. I found a place to have fish and chips for lunch and rode a double-decker bus to the ferry port--how Irish! Fortunately, this time the ferry ride was quite smooth and I embarked on the next stage of my journey.